Photo by New York World-Telegram. Our calendar has brought us to an unusual place whereby we observe three significant moments of American history at the same time. We celebrate the second inauguration of Barack Obama as President of the United States, we remember the life the Rev. Dr. Martin Luther King, Jr., and we mark the 40th anniversary of the Roe vs. Wade Supreme Court decision. Each of these is significant in their own right, and their impact inarguably has and is influencing the state of our nation, society, and culture. The observances of these historic events align well with some of the existential givens that guide our clinical work with individuals and families. Each of these observances speaks to the disputes concerning our nation’s sense of purpose in an ever-changing world. Each of these observances highlights our culture’s struggle over defining life and death as medical research presses against previous delineations. Each of these observances emphasizes our society’s debate over how we are to care for one another while protecting individual rights. Each of these observances magnifies the divisions and derisiveness we experience with our neighbors, our coworkers, our friends, and our families. Most often these conversations take place in a context of black and white, right or wrong, good or bad, and strength versus weakness. These discussions, frequently, are reduced to who talks the loudest and the longest, and conclude in name calling, at best. In accordance with the humanistic-existential approach, dissonance and disagreement is not a bad thing, growth only takes place when there is discussion and discourse about disparate perspectives and ideas. However, in order for healthy dialogue to take place, participants must place understanding above being right, insight above manipulated statistics, reflection above defending the “cause,” and love above control and power. Jason Dias and Lisa Vallejos, two fellow New Existentialist bloggers, have discussed the nature of love and being love in recent entries. While it may sound trite, maybe even simplistic, how we demonstrate or live love is the core question and concern of all the current discourse. What does it mean to love? How does love become tangible in our personal relationships, our community, and our society? How do I be love for myself, for my family, for my neighbors, for my culture? In what way will love define and shape your legacy? Every now and then, I guess, we all think realistically about that day when we will be victimized with what is life’s final common denominator—that something that we call death. We all think about it. And every now and then I think about my own death and I think about my own funeral. (E)very now and then I wonder what I want them to say. Tell them not to mention that I have a Nobel Peace Prize—that isn’t important. Tell them not to mention that I have three or four hundred other awards—that’s not important. Tell them not to mention where I went to school. Yes, if you want to say that I was a drum major, say that I was a drum major for justice. Say that I was a drum major for peace. I was a drum major for righteousness. And, all of the other shallow things will not matter. I won’t have any money to leave behind. I won’t have the fine and luxurious things of life to leave behind. But, I just want to leave a committed life behind. And, that’s all I want to say. Yes, Jesus, I want to be on your right or your left side, not for any selfish reason. I want to be on your right or your left side, not in terms of some political kingdom or ambition. But, I just want to be there in love and in justice and in truth and in commitment to others, so that we can make of this old world a new world. 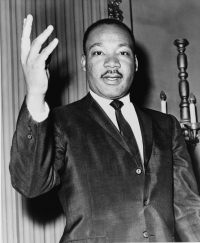 King, Jr., M. L. (1968). The drum major instinct.